Professional corporate spokesmen and spokeswomen are the backbone of trade show message delivery and brand enhancement. Today’s dedicated speakers are the best in live event history; they know their clients, their clients’ companies, and those companies’ products. They take a personal stake in effectively representing your brand, acting as potent team members to get your word out and create awareness for current and potential customers. Marketing experts rely heavily on expert spokespeople to achieve what their own design, sales, and marketing teams can’t or don’t want to do – make a real connection. Today, 50-100 industry-leading corporate narrators – most of them based in the US – dominate trade show floors every week, representing the biggest brands at the world’s top influential conferences. They travel the country and the globe speaking on behalf of the world’s most powerful multinationals. They deftly expand marketing reach and improve communications between providers and the valuable market shares they serve. Who are these expert speakers? And how do you find the right one for your brand – that perfect face and voice to represent your marketing needs? Every spokesman has their own style, just as every brand offers something unique to the marketplace. Showing the image to your clientele is key, and requires careful consideration and research. Hire the right speaker and your investment pays off many times over. Hire the wrong person and your budget and public showing are quickly undermined. Here are some tools to help improve your odds of making the best possible decision. The best tradeshow spokesman is a full time professional, dedicated to corporate events as their primary industry and income. With years of experience and deep knowledge of corporate structures, this is your go-to representative, with the power to command a booth, credibly speak on behalf of your product or service, and handle any and all situations that arise during a live event. A seasoned pro understands how to partner with your sales team. They excel at customer relations and respect the needs of your clients. It takes total dedication to handle messaging and people with equal dexterity, and only a full time speaker can offer that level of service. The fastest path to disappointment – and poor event statistics – is to hire an actor or model, dabbling in trade shows as they wait for their big break in television or on the stage. Agencies offer these secondary players en masse, ready to fill any job with a pretty face just to earn a percentage. There are several reliable, strong agencies out there, but most marketing managers put their trust in the wrong agency because they don’t know what other opportunities exist, or where to find the best speakers. Always demand a dedicated, proven professional narrator. 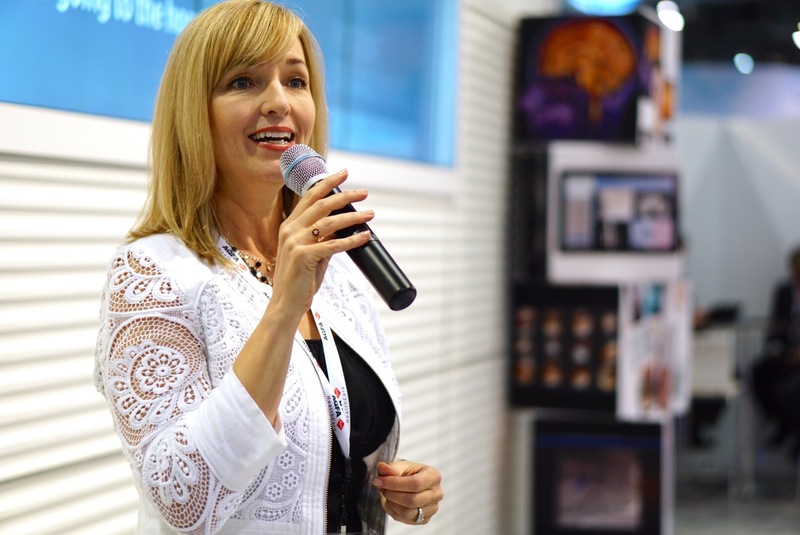 Understanding what you need to achieve at your event will help you choose the right professional tradeshow spokesperson to deliver that expected outcome. For example, if you’re looking to build credibility and expand product knowledge, you want a spokesperson who specializes in technical narration and deep product content. If you’re interested in enhancing overall brand perception, you need a spokesman specializing in personality and charm, one who not only connects with attendees but alters their view of your company for the better. Planning a new product launch? Your representative should be rock solid with press and C-level executives with a strong sense of media to support confident message delivery. If it’s about numbers – volume over quality or conversion rate – a magician or specialty infotainer might be your most successful and beneficial trade show investment. Know your targets in advance and hire the right expert to fulfill those goals. One of the biggest mistakes event marketers make is viewing their expert spokesperson as an afterthought or last-minute plug-in, once all other key strategic and messaging decisions have been made. It’s a missed opportunity and an negatively effect message consistency. Your spokesman is a seasoned pro specializing in live events, best practices, and trade show audiences. Leverage your investment by using your speaker’s weekly experience to your benefit. The best trade show spokespeople are at conferences 20-40 times per year, speaking on behalf of companies in every sector, at every corporate structure level, to every type of potential buyer; these people know your market and how to make a message stick. Once you’ve contracted their services, invite them to team meetings and encourage their participation in planning and design sessions with your booth builder and logistics providers. Everyone will benefit, and your final message will be fully integrated into your entire booth. It’s universal truth, as much in the trade show world as in buying a suit, a TV, or a car. You’re looking for a dedicated, specialized professional to be your brand’s first point of contact and most forward-facing voice to the customer; this is no place to skimp or bargain hunt. You don’t need to spend a fortune, but you can’t expect the cheapest option to deliver peak ROI. Budgets are tighter than ever. Marketing teams are pressured to deliver more with less, cut expenses, eliminate middlemen, and rely on key vendors to perform the maximum for the minimum. The best professional trade show speakers are priced similarly, with few exceptions, and realize exceptional value-add for your investment. They go miles beyond speaking to offer theatre and booth coordination, crowd control, crisis management, personnel services, creative input, scripting, sound system troubleshooting, neighbor relations, customer direction, and much more as part of their salary. A lower grade of speaker might save 20-50% of your spokesperson budget, but the ROI in customer reach and follow-up success will suffer. It’s an easily avoided penny wise/pound foolish mistake. Remind yourself what you’re investing in: The first voice your customer will hear when they arrive in your booth. The first face they’ll see, the first information they’ll absorb, and the primary image they’ll take away. Invest wisely, but be prepared to invest. Your expert professional spokesperson wants you to succeed. They’ll use every weapon in their arsenal to create buzz, drive interest to your demos, support your sales team, and to make you and your company look great. Give them the tools to succeed. Theatre seating is a must; attendees walk miles every day and unless there’s a specific and strategic reason to keep them standing it’s a mistake to do so. A seated audience is far more receptive to the message your speaker wants to give; no seating makes communication harder. Make sure your booth builder or AV vendor provides an appropriate, high quality sound system. There’s no point in investing budget, time, resources, and personnel to offer a theatre or messaging platform only to save a few dollars with cheap speakers that are too small, badly positioned, or deliver weak sound. For your spokesperson to connect with potential clients they have to be heard – and heard clearly. Trade show floor competition is fierce; if your sound system is weak, it’s a sure bet your competitors across the aisle will get the attention. Swag and giveaways aren’t just expected by trade show attendees, they generate scans, leads, and create positive association with your brand. Your spokesperson uses them to help entice reluctant or reticent audience members to commit to your booth, and to stay for your complete message. If you offer your audience nothing but a pitch you’re neglecting success measurement data and diminishing opportunities for success, both for the staff and for your spokesperson. Expert presentation works best when paired with professional crowd gathering services in the aisles, stopping guest in their tracks, diverting them onto your stand, assuring they’re primed to receive the powerful message your spokesperson is ready to give. Manning the stage while leaving the aisles bare is a rookie mistake; without this vital and affordable partner, your spokesperson must divide his or her efforts to wrangle crowds, scan badges, and speak non-stop throughout the day which weakens not only their voice and energy but also their authority. It’s bad business.